Anna walks to school daily with head down. She is an easy bully for her friends who find her too slow and lazy. The teacher gets annoyed in class as she is often found sleeping during her classes. Her parents find it hard to make her do any work or activity at home as she is often too tired or sometimes even loses her temper frequently. Her neighbors find her too shy and reserved. She has no friends. No one knows that this child is suffering from a condition known as Anemia. Before understanding what is Anemia, let us first discuss what are the frequent myths associated with this condition. Myth # 1- Anemia is genetic. This is a false statement. Anemia has nothing to do with your genes. Offspring of anemic parents do not necessarily become anemic. Myth # 2-People with Anemia cannot practice physical exercise and Sports. This is a great myth. Although one can get easily tired, this can in no way stop him or her in pursuing her sports activity. Myth # 3- Anemia means you do not feed your child well. In short poor diet. Poor diet may not be the one and only cause of Anemia although it might be one of the cause. For example, a child can also have Sickle cell Anemia which is a rare condition in which the body produces a very different type of hemoglobin that does not allow proper transportation of oxygen to the blood. Now that we know about some of the Myths associated with Anemia, let us now ponder on the topic of Anemia. Anemia is a body condition when the red blood cells in our blood are less than what is supposed to be normal level at a given age of the child or adult. Each red blood cells in our body are filled with a special substance called hemoglobin. Hemoglobin is nothing but a special pigmented protein that is responsible to transport oxygen to various cells in our body. Every cell present in your child’s body be it in muscles or any vital organs needs an adequate and regular supply of oxygen to function well. Hence when the red blood cells in our body are decreased it produces and undue stress on these vital organs and overall on the entire body. This might also lead to other serious conditions if not treated well. The good news is that it can be easily detected and once it is detected and identified if proper remedial action is taken it can be easily treated. However, it needs to be detected first. 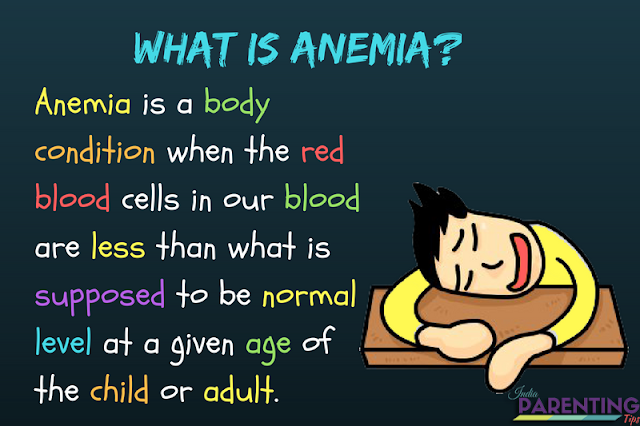 Child Anemia is not very difficult to identify. One must have a good vision. (Huh!!! No). Unfortunately, Anemia in children is often neglected as the parents feel that they are providing an adequate amount of food to the child. This is not always true. Coming back to where I had begun this discussion. Anna’s parents think she is just too shy and lazy. Her friends bully her as they find her always sleeping in class. The teacher is not happy as she finds her inattentive in class. But no one goes deep to check why? It is because it is easy to blame one rather than to take responsibility to know the reason behind the issue. How can I prevent my child from Anemia? This is a common question that comes to our minds when we hear about any disease or issues that might affect our child. Here are some essential tips for children if followed might be quite handy and helpful. Cow milk to be avoided till the age of 1. It is best to avoid cow milk until the child reaches the age of 1. This is because having cow milk may result in blood loss for the child in his or her stool and it also causes the decreased amount of iron absorption in the gut. For Breastfeeding children, it is a good news because mothers milk contains an adequate amount of nutrients and iron in the body needed for the baby till the age of 4 months. After the child reaches 4 months on age other solid foods rich in iron should be introduced taking the help of a pediatrician. For Formula fed children one has to make sure that the children are given milk formula which has an adequate amount of iron content. Do not give more than 2 cups of cow milk as it contains less amount of Iron. Please ensure you add another health formula along with milk which has the good amount of iron content. Older children should be given a balanced diet rich in iron content. Ensure a balanced diet for the older children and you may take help of a nutritionist who might be the best guide to make a food chart for your child depending on his or her age and activities performed. Encourage and make a habit of drinking Citrus juice daily which would increase Vitamin C content in our body which works great to get iron absorbed in our body. Remember that you are the best doctor, the best teacher, the best guide and always the best person to know about your child. Spare a little more time and attention in your hectic schedule and you can surely make a huge difference in your child’s life. 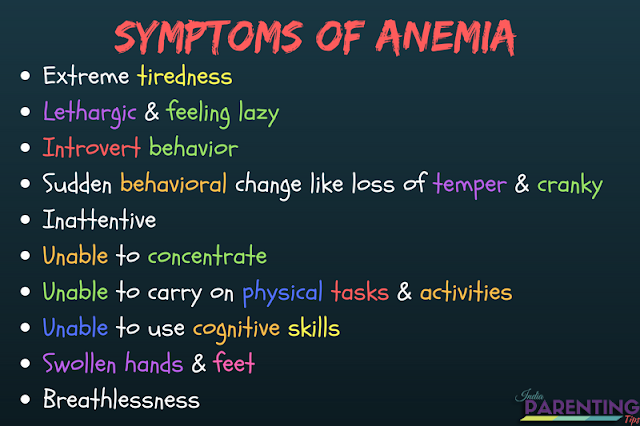 If you feel that your child has any of the symptoms of Anemia, get her or his blood tested and check with a pediatrician immediately. With proper corrective action at the right time, Anemia in children can be easily treated and cured.